Not to be confused with Snow Ride. 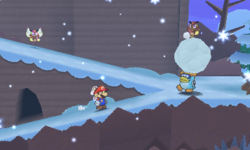 Snow Rise is the first level of World 4 in Paper Mario: Sticker Star. It is a typical snow level inhabited by many Shiny enemies. It also is plastered with many Shiny Stickers. Birdo also makes an appearance here. The level starts out on a dock and a teal grass island, followed by the actual level covered by a blanket of snow. In the next room is a hill that can be climbed up to reveal a tree that resembles an ice cream cone. Using Paperize here and placing a Fire Flower or a Burnhammer in the tree will melt the snow to reveal the "Pipe in a Cave" scrap. The next room is the massive central slope. Upon entering, Cooligans will start sliding down the hill in an attempt to damage Mario. Past the hill is a steep slope patrolled by Snow Spikes. To the right are two hills that lead both up and down. The down path takes Mario to a leveled, out-of-reach hollow where the Pipe in a Cave scrap can be placed, along with a hidden block with a Shiny Eekhammer. The upper path leads to a snow pile that can be jumped through to fall down into the leveled hollow, enabling entrance to the pipe. The pipe takes Mario to the secret exit, unlocking Whiteout Valley. Going further up will take Mario to a cave entrance that leads to a peak with a tree. Whacking this tree three times will cause Birdo to appear on a swing and toss the Goat item down to the peak from a faraway mountain. The left path of the steep slope leads to a cave with a few shiny stickers and a pathway to the upper part of the central slope. The Radiator Thing sticker can be placed on the pedestal right there to melt the mountain, revealing an entrance to the mountain climb. Going further left will take Mario to the ice cream cone tree, allowing the Pipe in a Cave scrap to be collected. Back at the upper slope, the newly revealed passage can be entered to find a mountain guarded by more Snow Spikes, except this time, Shiny Goombas will jump on top of their snowballs and ride down them in an attempt to deal more damage to Mario. Going all the way up the mountain will lead to the Comet Piece and Ice Flow. The Secret Door mark is located on the lower slope's left side after the snow is melted away. It contains the Cell Phone. This page was last edited on June 30, 2018, at 16:01.